September has always been one of my favourite months. Why? Because it feels like such a transitional month. This is the month of going back to school, of winding down from summer holidays, of settling back into work. Bouquets of sharpened pencils. School supplies. Then there is the weather. Change is in the air. It is getting cooler and crisper, the trees will soon start to turn colours, but even so, summer will hold on for as long as it can. As of late, I have been feeling inspiration everywhere. I cannot tell why I am feeling such a way - if its because I am back from holidays, I am burning apple cinnamon candles (very excited for fall), or for other reasons. But I am not letting it stop me. I want to create, I want to be still, I want to inspire. 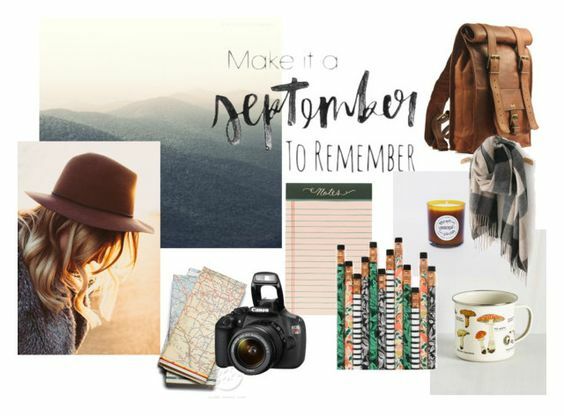 I decided to put together a little Septembers Goals list - a collection of things to do by myself or my family that make this month a "September to Remember." Visit // I really want to visit the Devonian Botanic Garden and the Muttart Conservatory. I also want to revisit the Edmonton Valley Zoo. We had a blast last September, and I think Bug would really enjoy it. Photography // I would like to journey through the river valley a lot in the next couple of months and take some photographs. The weather change is definitely a favourite of mine and I would love to be able to create some stylized photo shoots as well as explore the area. Smell // One of my favourite bloggers created the Lindbergh Candle Company last year and I really would like to get my hands on some of her yummy-sounding Autumn Candles. Last year there was a candle called Lumberjack that I hope comes back this year. It sounded amazing. I also want to get my hands on December Morning & Cabin. Their scent page is here if you want to read their candle descriptions! I also want to get the Le Cirque des Reves & Hatter's Tea Party Candle by Frostbeard! Read // Over our summer holidays we had a lot of down time around the campfire. Which has made me fall in love with the Wise Man's Fear by Patrick Rothfuss again. The second book of the Kingkiller Chronicles has taken me a while to get through, but not because it isn't amazing. I have just been falling in and out of love with reading. However, I am back in again, and I want to keep it up! I am still reading BFG by Rolald Dahl to the girls and my husband and I have also started reading The Invention of Hugo Cabret by Brian Selznick to Bug - its our Family Book. Next books on my to read list are : The Little Prince (By Antoine De Saint-Exupery), Harry Potter & the Cursed Child (By J.K. Rowling, John Tiffany, and Jack Thorne), All the Light We Cannot See (By Anthony Doerr) and I want to reread the Hobbit (J.R.R. Tolkien) and the Skystone (by Jack Whyte). Food // I feel like I am in the comfort food zone. Let's start making and eating foods fit for Kings, feasts, and holidays. I want to be creative and festive. This cake has been calling my name and this drink would be delicious on a cold, rainy night whilst snuggled in cozy pjs with a movie. I also want to make all the recipes created by Bryt from Food in Literature. Especially Apple & Mint Ice-cream, Twice Baked Honey Cake, and Bubble & Squeak. Projects // A while ago now I mentioned that I wanted to start using a Bullet Journal. Well, that is about as far as I got - I want to actually starting creating and using it. I have two crochet projects that I would like to complete this month (a blanket and a gift), and I would like to get started on my Winter crafts for my Mother's gift shop. I would also like to make more Love Knot Necklaces.